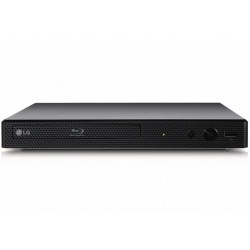 The compact design of the DVD player allows it to fit almost anywhere. Whether you have a small living space or you are low on storage, this entertainment device fits snuggly either horizontally or vertically next to your television taking up minimal space. Ideal for a bedroom, kitchen or small living room! The curved front edge and easy display buttons on the device display a smart, stylish finish. 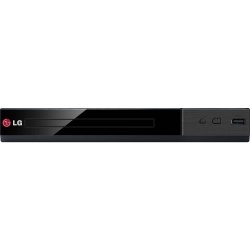 Performing as so much more than just a DVD player, this entertainment player has the ability to play CD’s as well as streaming videos and displaying images via the USB port. Accepting a variety of formats including MP3, MP4 and JPEG discs, you can be sure that you are well equipped for all of your entertainment needs. 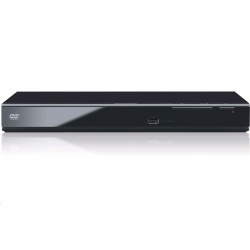 Included with the Compact DVD player is an easy-to-use remote control, allowing you to conveniently take control over your viewing. Memories on the big screen. Want to view a highlight reel of the family vacation in the comfort of your living room? USB Media Host lets you view family photos, watch videos and listen to music from USB storage devices. Watch your DVD collection in Full HD-like quality while enjoying the latest Blu-ray™ in breathtaking detail. *Compatible with Full HD TVs. Full HD up-scaling dramatically improves the resolution of any original content to Full HD. Simply connect an external storage device to play your favourite photos, movies, music and more on a bigger screen. 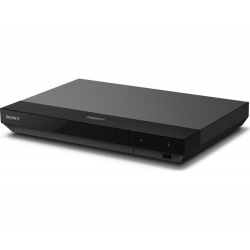 Enjoy the best quality entertainment with a Sony UBPX700B Smart 4K Ultra HD Blu-ray Player. Movies, shows and more are displayed in exceptional 4K Ultra HD quality. From explosive blockbusters to engrossing nature documentaries, whatever you're watching will leap off the screen. You can watch Blu-rays, DVDs, and you can even plug in a USB stick and watch a range of other file formats. HDR (High Dynamic Range) enhances the colours of what you're watching to give greater realism and a richer viewing experience. Watch all your favourite online streaming services by connecting the UBP-X700 to the internet with its built-in WiFi. You can even connect with an Ethernet cable if you prefer. So whether you want to binge on a series or just relax with a few funny cat videos, there's plenty of streaming content to be discovered. Aside from playing Blu-ray discs and DVDs, you can also play a variety of audio files. What's more, they'll be played in Dolby Atmos, so you'll get excellent sound quality. With its slim design and minimal black colour, the UBP X700 easily fits into your home set up. It's simple to place around your home, and it won't stand out either.